The group’s first release for Centaur centers around the dispersed Scots and their descendants, looking at how traditions and ideas have been handed down to current times. 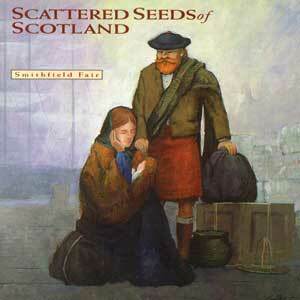 The songs are largely traditional presented in contemporary settings, while remaining true to Scottish traditional stylisms. The new material on the album reviews events of the past and demonstrates their relevance to today, as well as serving as a call to honour and to preserve ancestral traditions and ties. Guest artist: Joel Boyer on harpsichord on Gradh Geal Mo Chridhe, piano on Och, Och. Tae the Weavers Gin Ye Go (Traditional, Robert Burns), James of the Glen (D-B. Smith), The Worshipping Stones (D-B. Smith), Gypsy Rover (Traditional), Catch the Wind (Donovan P. Leitch), Gradh Geal Mo Chridhe (Traditional), Home to Islay (Jan & D-B. Smith), Mary of Argyll (Sidney Nelson/Charles Jeffries), John Anderson My Jo’ (Traditional, Robert Burns), The Bonnie Banks of Loch Lomond (Traditional, Lady Carolyn D. Scott), Mairi’s Wedding (Traditional), Cam Ye O’er Frae France (Traditional), Robi Donna Gorach [Nae Mair We’ll Meet Again]/Och Och Mar Tha Mi [The Islay Maiden] (Traditional), The Children of Scotland [Clann nan Alba] (D-B. Smith), Loch Voil to Loch Linnhe (D-B. Smith).